Early warning: I shall be leading a walk for the Skye and Lochalsh branch of SWT from Duntulm to Rubha Hunish on Saturday 12th June 2010. I hope to look at Loch Cleat which has some interesting records, the castle area and sea cliffs followed by a walk out to Rubha Hunish. This is the northernmost point of Skye. I have produced a listing of plants in taxonomic order for the Flora of Raasay and Rona. There are also two short links available to the flora: http://tinyurl.com/Raasayflora and http://bit.ly/Raasay. The number of unique visitors now stands at 633. A report on the second half of 2009 is now on my home page but there is little new in it for avid followers of this blog. Quite a few visitors have been to this blog even though I haven’t added anything for nearly two months. I hope you have found useful things. 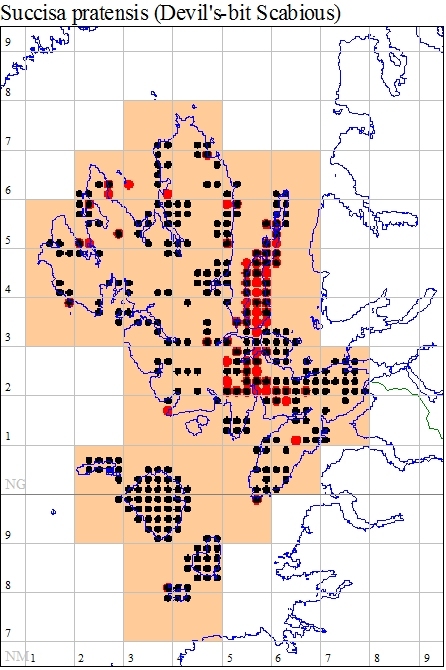 The black dots show tetrads (2 x 2 km squares) with records from 2000 to 2009; red dots are earlier records that can be localised to this scale. This shows that the Small Isles and the islands to the east of Skye have been pretty well covered in recent times. What is also apparent is just how much there remains to cover on Skye. It would be nice to have visited most tetrads by the end of 2019 but we shall see…..